Due to a snow/ice storm for the last few days I couldn’t get to a grocery store so I had to be very creative when making meals. This recipe came to me by grabbing stuff I had in my refrigerator and throwing everything together in a large Dutch oven and roasting it. 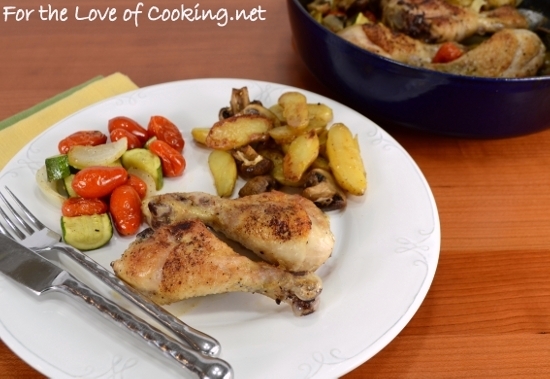 The chicken was cooked perfectly and the fingerlings were tender and flavorful. I love that the juices from the mushrooms and tomatoes flavored all the other ingredients. 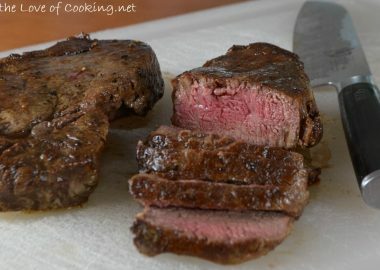 This was a super simple meal that smelled incredible while roasting and tasted even better. My kind of comfort food. 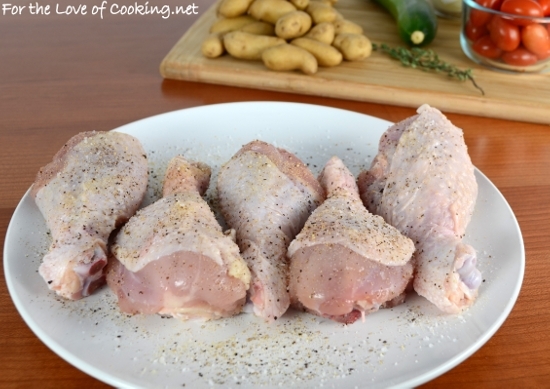 Season the drumsticks evenly with sea salt, freshly cracked pepper, and garlic powder, to taste. Place them uncovered into the refrigerator until you’re ready to eat (mine were in the refrigerator for close to 2 hours). 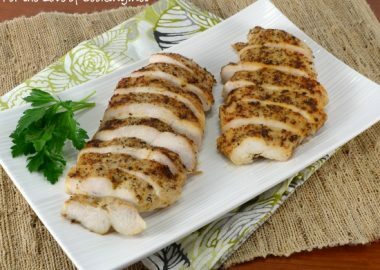 Remove the chicken from the refrigerator 15 minutes prior to cooking so it can come to room temperature. Place the fingerling potatoes into a pot of boiling water and cook until fork tender, about 5 minutes. Drain and let cool.Once the potatoes are cool to the touch, slice them in half lengthwise then toss into a bowl. Add the grape tomatoes, zucchini, mushrooms, and onions to the bowl. 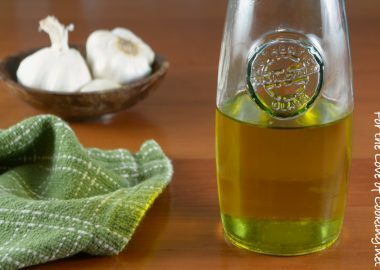 Drizzle with olive oil then season with garlic powder, sea salt, and freshly cracked pepper, to taste; toss to coat evenly. Heat a large Dutch oven coated in cooking spray over medium high heat. 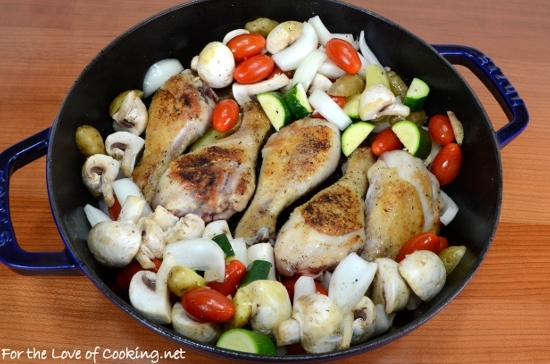 Add the drumsticks to the HOT Dutch oven and cook for 4-5 minutes then flip the drumsticks over. 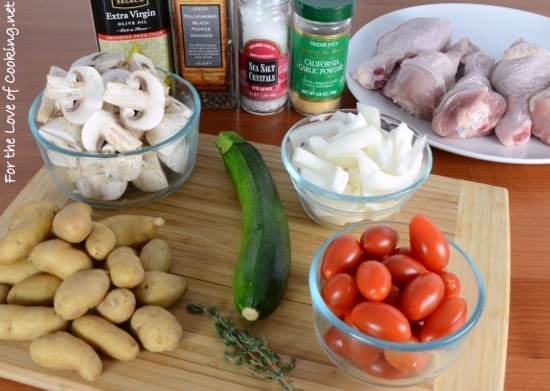 Remove from the heat and place the veggies around the chicken; add the sprig of fresh thyme then place into the oven. Roast for 15 minutes then stir the veggies. Continue to roast for an additional 10-15 minutes. 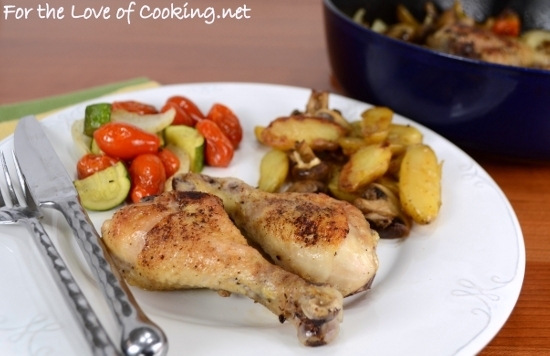 Remove from the oven and toss the veggies so they are coated in the wonderful pan juices. Serve. Enjoy. 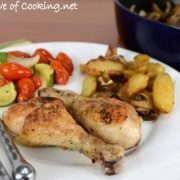 Season the drumsticks evenly with sea salt, freshly cracked pepper, and garlic powder, to taste. 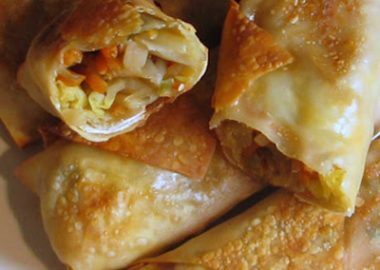 Place them uncovered into the refrigerator until you're ready to eat (mine were in the refrigerator for close to 2 hours). 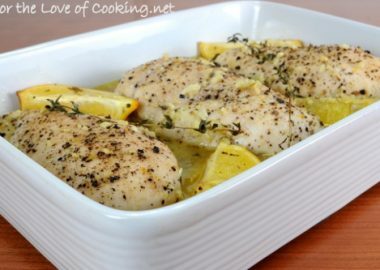 Remove the chicken from the refrigerator 15 minutes prior to cooking so it can come to room temperature. 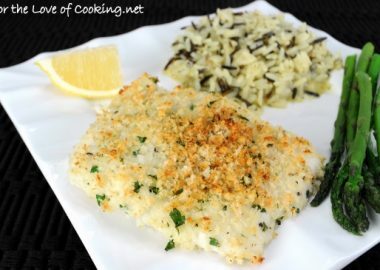 Looks like the perfect comfort food for a cold, snowy day!!! Great use of the odds and ends that you had on hand! Yup. Just can’ go wrong there! 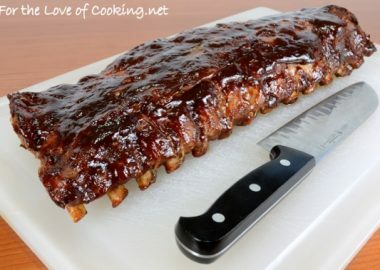 I can almost smell it! A perfect winter meal! The boys are going to grab some milk this afternoon, because I suspect another 8 to 12 inches of snow will have us blocked in until at least Saturday! I love that this is one pot full of delicousness! Drumsticks are my favorite!